INTERPET T8 BALLAST. USED IN GOOD CONDITION & FULL WORKING ORDER HOWEVER HAS A CRACK AT ONE END. MAY HAVE MARKS/ SCRATCHES TO THE CASING BUT NOTHING MAJOR AND NOTHING WHICH AFFECTS USAGE. ORIGINAL BOX AND MANUAL ARE NOT INCLUDED. 2 x 9 Watt POND CLARIFIER FILTER PLS 2 PIN G23 UVC BULB. GPX "PLS" UV lamp 9 watt 2 Pin G23 Cap. UVC Radiation (watts). FREE 25g SAMPLE OF PETTEX POND FOOD WITH EACH ORDER! Our UV bulbs fit a wide range of units from many manufacturers including, Hozelock, Oase, SuperFish, Fish Mate and many more. 18 Watt POND CLARIFIER FILTER PLL 4 PIN 2G11 UVC BULB. GPX "PLL" UV lamp 18 watt 4 Pin 2G11 Cap. UVC Radiation (watts). FREE 25g SAMPLE OF PETTEX POND FOOD WITH EACH ORDER! Our UV bulbs fit a wide range of units from many manufacturers including, Hozelock, Oase, SuperFish, Fish Mate and many more. Connection - GX23 PLS. 13w UV bulb. Suitable for pond & aquarium UV sterilisers. Cable Length. We will provide professional and reasonable solutions for you. 220-240V, 60Hz. Connection - 2G11 PLL. 24w UV bulb. Suitable for pond & aquarium UV sterilisers. Specifics – 9W. Makes fighting green water easier. Treats up to 200L (50Ga) of saltwater & fresh water aquariums. Suction cup mounting - no hardware required. Water pump included. UVC Radiation (watts). FREE 25g SAMPLE OF PETTEX POND FOOD WITH EACH ORDER! Our UV bulbs fit a wide range of units from many manufacturers including, Hozelock, Oase, SuperFish, Fish Mate and many more. *Including:one UV Steriliser one UK/EU/AU adaptor CUV-111A Voltage : 220/240V Power consumption : 15W UV-C:11W UV-C(%)8000hours:80 Capacity : 10000L Max Pressure:0.3bar Through Flow:1700L/H Inlet&oulet adapter:¾"-1½" Cable Length :1m/2m Length : 340mm Weight(Kg) : 1.7kg. TUV PL-S 11W/2P UVC Germicidal - 11W 2 PIN G23 Lamp For Pond Filters. Condition is New. Dispatched with Royal Mail 2nd Class. UVC Radiation (watts). Our UV bulbs fit a wide range of units from many manufacturers including, Hozelock, Oase, SuperFish, Fish Mate and many more. Osram - HNS S 5W G23. GE - GBX5/UVC 5W GERMICIDAL UVC. PLS-S 5w TUV compact germicidal bulbs emit radiation at 253.7nm and are used to sterilize water and remove algae in garden ponds. Bioforce 3000 UVC. GPH212T5L/4 UV Lamp 41001 USA. Type: Germicidal Ultraviolet UV-C. Style: Linear Single Ended. 4-Pin Base T5 (4 pins on ONE END). Base: 4pin T5 (4pins on ONE END). UPC 642125526883. Length: 8.5". In this UVC clarifier fit all 16/22 he hoses !!! Instructions:This UVC clarifier is already already assembled and ready to use.There is an Input and an output. Sitting at the entrance Start of Stomkabels (Supply port). 36 Watt POND CLARIFIER FILTER PLL 4 PIN 2G11 UVC BULB. GPX "PLL" UV lamp 36 watt 4 Pin 2G11 Cap. UVC Radiation (watts). 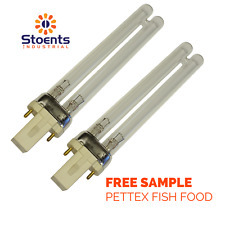 FREE 25g SAMPLE OF PETTEX POND FOOD WITH EACH ORDER! Our UV bulbs fit a wide range of units from many manufacturers including, Hozelock, Oase, SuperFish, Fish Mate and many more. G55T8 UV lamp 55 watt 4 Pin PLL 2G11 Cap. UVC Radiation (watts). FREE 25g SAMPLE OF PETTEX POND FOOD WITH EACH ORDER! Our UV bulbs fit a wide range of units from many manufacturers including, Hozelock, Oase, SuperFish, Fish Mate and many more. GTL3 - 3 watt (3W) UV. Germicidal Light Bulb. Special Desc: Germicidal (254nm), Preheat. Bulb Shape: T-6. Helpful Links. Avg Life 2000. SIGNIFICANT: To optimize the effectiveness of the UV sterilizer, it is important to ensure the good quality of the water to be treated. Power: 120W. For most microorganisms, effectiveness of UV against microbiological contaminants such as bacteria and the virus is total. 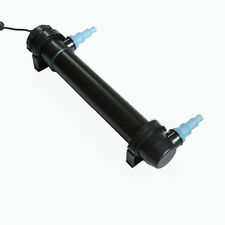 11 Watt POND CLARIFIER FILTER PLS 2 PIN G23 UVC BULB. GPX "PLS" UV lamp 11 watt 2 Pin G23 Cap. UVC Radiation (watts). FREE 25g SAMPLE OF PETTEX POND FOOD WITH EACH ORDER! Our UV bulbs fit a wide range of units from many manufacturers including, Hozelock, Oase, SuperFish, Fish Mate and many more. Jebao Tetra Pond. Base: 2G11 (4-pin) Straight Pin. |Germicidal Ultraviolet|. Length: 8.25" Long. The germ and algae in the water will be killed when the water under the irradiation of wave length in 253.7nm's ultraviolet radiation in a short period. 1 x UV Light Sterilizer. Suggested mount the unit on aquarium wall vertically under water 1.5-5.0cm depth. To optimize the effectiveness of the UV sterilizer, it is important to ensure the good quality of the water to be treated. In practice, the bacteria and viruses are the cause of many pathogenic diseases carried by water. Item Type: UV sterilizer. 1 UV sterilizer. Strong UV-C sterilization, effectively remove the mite. Battery Type: 6F22 9V Battery(Not Included). If you do not receive our reply within 48 hours, pls. Bulb: 4 x 40 W (36T5 HE 4P SE GERMICIDE). Power: 160W. SIGNIFICANT: To optimize the effectiveness of the UV sterilizer, it is important to ensure the good quality of the water to be treated. The UV is known to be highly effective against bacteria, viruses, algae. 2 X 11 Watt POND CLARIFIER FILTER PLS 2 PIN UVC BULB. UVC Radiation (watts). FREE 25g SAMPLE OF PETTEX POND FOOD WITH EACH ORDER! GPX "PLS" UV lamp 11 watt 2 Pin G23 Cap. Our UV bulbs fit a wide range of units from many manufacturers including, Hozelock, Oase, SuperFish, Fish Mate and many more. Instructions:Install the UVC clarifier cooperate as it is shown in the image gallery. There is an Input and an output. Sitting at the entrance Start of Stomkabels (Supply port). For use in Fish Pond UV Clarifier Filters, sterilisation purposes. 10x 8W T5 UVC, Ultra Violet, Germicidal UV Clear Tubes. For Fish Ponds Etc. UV power: 5W. Pump power: 5W. Install in vertical or horizontal position right in your aquarium or sump. Great for both fresh and salt water aquarium. 1 Oxygen Pump. Due to the light and screen difference, the item's color may be slightly different from the pictures. 1 x Ultraviolet Sterilizer (including 18 watts UV lamp). External ballast with on/off switch. Indicator Screen Design. UV-C Lamp(W):18. Inlet & Outlet Adapter: 3/4"~1-1/2". High Clarity Quartz Glass Chamber.